This hall is about twice the size of last time and with more space we can offer more stalls and also have a side room so are hoping to add this year the option for a 20 minute talks/presentations during the evening. Again Redway Runners are picking up the cost of the event, but would be great, but not a requirement, for stalls to make a donation to the Redway Runners charity of the year. Remembrance Day is a day where people get together to remember the people that sacrificed their life to let us have peace. We get together to also remember those people that have gone to war and survived. In World War One, the fields couldn’t grow food, but when the war ended poppies started to grow so that is why we wear poppies as a symbol of Remembrance Day. We are lucky to live in a safe environment with water, food, phones, a lot of trees and good quality houses to live in. We have hospitals, fire stations and police to keep us safe. We feel grateful for what they did because we get to live in a country that has peace. For many of us today it is about remembering great grandfathers and grandfathers who fought in World War 1 and 2 and those family members who have fought and are still fighting in conflicts today. Remembrance Day means we can show our respect to those who fought and died or got seriously injured when they were fighting, to make the world a safer place to live in. If we had one wish, we would wish that war would stop because people deserve to live in a safe environment. If we could say something to one of the soldiers that died at war, we would say, “thank you very much for your service and sacrifice”. The memorial takes the form of a Private of the Oxfordshire and Buckinghamshire Light Infantry standing to attention with rifle, cal and belt but no webbing; he is mounted on a square plinth with a three-stepped base. There are 87 names listed for World War 1 and 15 for World War 2. Today I would like to remember – Corporal Reginald George Kightley service number 265217, who is listed on the New Bradwell Memorial;. Reginald was Redway Runners Colins Kightley’s dads 3rd cousin and therefore my 3rd cousin once removed. He was born in 1898 the eldest of 8 children (4 boys & 4 girls). Prior to the war he was a coach-maker in the Railway Works at Wolverton. He enlisted in Wolverton and joined the 1/1st Buckinghamshire Battalion, Ox and Bucks Light Infantry, and rose to become a Corporal. He was killed in action on 21st July 1917 he was 19 years old. He was killed on the Somme in France as were thousands of others. He has no known grave but he is recorded on the Thiepval Memorial, Pier and Face 10A & 10D. This memorial contains 72,000 British and South African Forces names; with no known graves, who died before 20th March 1918. At the time of his death his mother lived at 45 Spencer Street, New Bradwell, and his father had died. Arthur was born on 11 September 1918 in London. He was the deputy town clerk at Battersea Town Hall, London. He joined HMS Hood which at the time was the last battlecruiser built for the Royal Navy and commissioned in 1920. Hood remained the largest and most powerful warship in the world for twenty years after her commissioning and her prestige was reflected in her nickname “The Mighty Hood”. On 24th May 1941 early in the battle of the Denmark Strait, Hood was struck by several German shells, exploded and sunk within 3 minutes there were only 3 survivors, 1,415 service personal went down with HMS Hood that day. Arthur James Strong was 22 years old at the time. Albert was born about 1900 in Stantonbury, Buckinghamshire At that time there were 6 members of the French household living at 60 Young Street, Wolverton, Buckinghamshire. The grave of Rifleman Albert Edward French (1900-1916) is often visited in the cemetery located at “Ploegsteert Wood” where he lies buried. Young visitors in school groups are especially drawn to visit Albert because he was a sixteen year old at the time of his death on active service. On 15th June 1916 Albert was reported as having been “Killed in Action”. He died in a part of the British Front Line sector in Belgium near Ploegsteert Wood, just north of the French border. Albert had only been in the Theatre of War for 44 days. The reason why there are war graves in local graveyards is either because the serviceman died during training in the UK or they died of wounds or illness having been evacuated back to the UK. This also explains why several of the deaths took place after the end of the war. During the early summer of 2014 the Gt Linford Parish Council awarded a generous grant of £400.00 towards the restoration of the Roll of Honour which records the one hundred men of Great Linford who served during the First World War. This is now mounted beneath the War Memorial inside St Andrew’s Church. The grant also contributed to the cost of a booklet entitled “St Andrew’s Remembers”, the result of a project undertaken by a group of people from St Andrew’s Church to research the lives of eleven of the one hundred, who died during that war. During the research, it was discovered from the Parish records that one of these, CHRISTOPHER LORTON SAPWELL, was buried in St Andrew’s Churchyard in an unmarked grave which we have been unable to locate. Following communication with and enquiries to the Commonwealth War Graves Commission (CWGC), they have agreed to place a head stone in St Andrew’s Churchyard in recognition of Christopher’s service on the Somme. Christopher was born in January 1888 to Fred and Lucy Sapwell of 30, High Street, Great Linford. He was the eighth of their ten children according to the 1891 Census and at the age of 13 was a House Boy at Great Linford Manor. Christopher married Louisa Temple, also from Great Linford, on 27 February 1909 but at the time of the 1911 Census, Louisa is shown as living with her parents and two brothers in Rivetts Yard, Great Linford, whilst Christopher was in Northampton Hospital. After volunteering in June 1915 he underwent a period of training and was later drafted to France. During his service in this theatre of war he did excellent work attending to sick and wounded horses. Later in 1916 he was invalided to England with pleurisy and was finally discharged as medically unfit for further service on 14 June 1916. He was awarded the 1914-15 Star and the General Service and Victory Medals. Three of Christopher’s brothers who also served, Lance Corporal Albert Sapwell, Private Ernest Sapwell and Sergeant Walter Sapwell, all returned safely from the war. A copy of “St Andrew’s Remembers” can be read in the reference section of CMK Library. We are here at a memorial that commemorates the fallen men from South Africa and across the Commonwealth who gave their lives not in the defense of their own soil, but an ideal of freedom and liberty for their brothers. They knew that tyranny must be confronted and defeated, not only in their own itneighborhoods but anywhere it is found the world. The men and women memorialized here offered the greatest sacrifice in the name of brotherhood and to overcome evil with good. To overcome hate with love. To overcome division with unity. It is even more poignant in our current age—where people are divided and more full of hate and vitriol than ever before. Let us remember that there was a time when the world came together, fought together, bled together, died together. Let us be reminded that there are higher causes—higher callings—than the normal ebb and flow of daily life. The book of John 15:13 puts it this way: Greater love has no man than this, that a man lay down his life for his friends. Over 5 million allied personnel died in World War 1, from over 20 nations. In the Central Powers, another 4 million gave their lives. Another 8 million civilian personnel died directly or during the aftermath. I would like to close by giving the roll of Allied nations and their fatalities and closing with a short prayer. Our heavenly Father, thank you for our strength and health and the ability to run today. But thank you most of all for your picture of ultimate sacrifice, your son Jesus Christ, who gave his life on the cross so that we can have life more abundantly. I thank you for the men and women who gave their lives on our behalf so that we can live lives of freedom and liberty. We ask that you help us to honor these men and women by our actions each day – to help to unify, to combat oppression and evil, and to love our neighbors. our staples; long life milk, long life juice, tinned meat (hot dogs, meat balls etc.) sugar, rice pudding, tinned fruit. 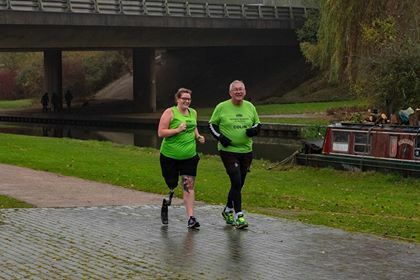 So please bring items along to the club Christmas party on Friday 14 December or pass to any of the run leads who will make sure it gets to Rena and Martin, so we can take it along after the event to the food Bank. Please just make sure that items are in date.